Golfers sometimes fall out with their fellow competitors, or opponents, over where they should stand on the putting green while putts are being made. In my opinion, regardless of where they stand it is more important that they should remain absolutely silent and motionless while anyone is making their stroke. A player must not make a stroke with his caddie, his partner or his partner's caddie positioned on or close to an extension of the line of play or line of putt behind the ball. Exception: There is no penalty if the player's caddie, his partner or his partner's caddie is inadvertently located on or close to an extension of the line of play or line of putt behind the ball. The effect of this is that a player may stand anywhere else on the putting green without incurring a penalty, including behind the hole (i.e. with the hole immediately between them and where the ball is being putted from). • Players should not stand close to or directly behind the ball, or directly behind the hole, when a player is about to play. 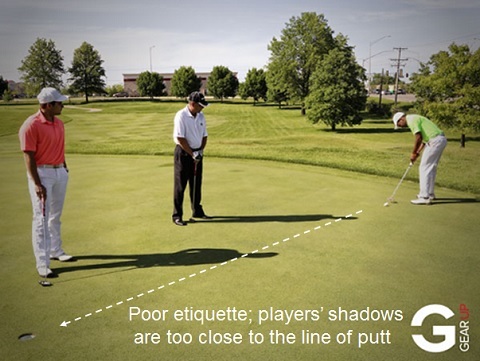 • Players should not stand on another player's line of putt or, when they are making a stroke, cast a shadow over their line of putt. Q. May a player's caddie purposely stand between the player and the setting sun so that the sun's glare is not in the player's face while he is playing a stroke? A. No. Such procedure is a breach of Rule 14-2A. Naturally, the above restriction also applies to a player’s partner, their partner’s caddie and a fellow competitor. 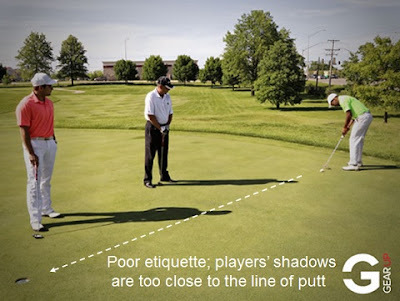 Similarly, a player may not request an outside agency to put their ball in the shade with their shadow, though they may ask them to stand aside in order to ensure that their shadow does not move and distract them as they make their stroke. My recommendation is that if you feel that someone is standing on the putting green in a position that may disturb or distract you, delay making your stroke and courteously ask them to move to a less intrusive position. A new season of golf is starting in the Southern Hemisphere. If you or your Club are participating in inter-club match play, why not familiarise yourself with the differences in match play Rules from stroke play Rules. Knowing them could be the difference between winning or losing! Check out this link. I have noticed in some scramble format tournaments that playing partners will stand behind the player that is putting to see the line for their own putt. Moreover, they will have the poorest putter putt first time provide a read for the better putters. What do you think of the etiquette of this? Not only is it bad etiquette, but it also is a breach of Rule 14-2b, incurring a penalty of two strokes every time a player does it. However, there is no problem with the order of putt unless the Conditions of Competition state that the player whose ball is beeing used must make the first putt. Both my partners and my ball where approx four inches off the putting green (on the fringe) and within four inches of each others ball.both balls more or less on a direct line to the hole. I marked my ball whilst my partner played his. As we were off the putting green, i stood behind him and watched his line of putt...i replaced my ball and as i was about to play the opposition called that i was not allowed to stand behind my partner and watch his putt as i had gained an advantage...i continued with my putt, invarably missing the putt. They then went on to win the hole..
Can you clarify the situation. In my head, as my partner and i were off the putting surface i was able to stand behind my partner and watch his stroke being played...which rule (if any, as the opposition challenged) had been breached. Your opponents were correct to claim the hole, as you had breached Rule 14-2, which states that a partner, caddie or partner’s caddie may not stand behind a player during their stroke anywhere on the course. Prior to 2000 this restriction only applied to the putting green.